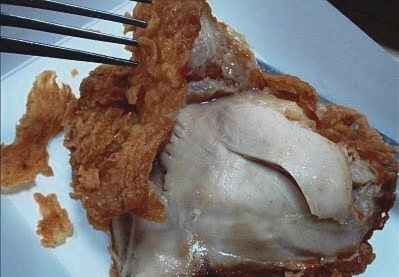 As for the KFC’s Extra Crispy chicken, there are customers who wanted it to be spicy and bold . The Hot and Spicy Chicken was introduced, although which the recipe has changed a bit (see original recipe) in this day and age. It comes frozen and is cooked frozen and not prepared fresh in many stores. Preheat the shortening in a deep-fryer to 350 degrees. Working with one piece at a time, dip in egg and milk then coat the chicken with the dry flour mixture, coated very generously. Fry half of the chicken at a time (4 pieces) for 12-15 minutes, or until it is golden brown. You should be sure to stir the chicken around halfway through the cooking time so that each piece cooks evenly.